Few advancements in video demonstrate as dramatic an improvement in image quality as High Dynamic Range (HDR). In the midst of today’s intense competition for content, the ability to implement HDR puts video providers miles ahead of operators that do not. The good news is that HDR can be readily implemented using a software-based video workflow, without significant investment in storage or bandwidth. For those in the media and entertainment industry, HDR offers immense opportunities, and a competitive advantage. Keeping track of the latest developments with HDR video is challenging, as technology options and standards continue to emerge. Inconsistencies abound when you seek to define HDR video in terms of color space, color depth, resolution, backward compatibility, metadata, codecs, and formats. And, with so many players in the marketplace offering HDR video under different names and technological capabilities, clarity is hard to come by. Register to see the webcast on-demand. Much more will be covered in depth. We’ll explore the state of HDR today and how to prepare for coming opportunities. 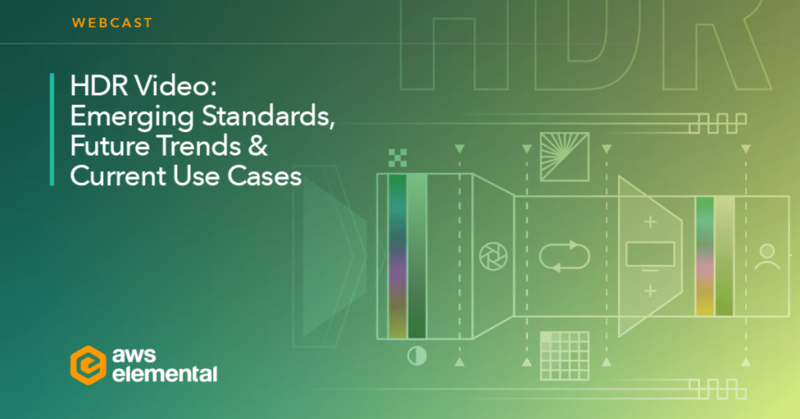 We’ll discuss the definitions, concepts, variables, and marketplace options for HDR video, so that content creators, broadcasters, and cable, satellite, and OTT distributors can make informed and fair evaluations. Watch the webcast and get the details. In the meantime, for more general questions and answers about HDR video, see What is High Dynamic Range (HDR) Video? Dan Gehred is a Solutions Marketing Manager for AWS Elemental.